Chidambaram is 47 km from Cuddalore. The temple is located at middle of the municipal town sprawls in an area of 40 acres.The God of cosmic dance Lord “Shiva” temple. Built during 11 century by Vikrama Chola and His successors. Golden roof of this temple adds attraction to this temple. It is known a “Thillai Kali Amman” temple is on the northern end of Chidambaram town. It was built by Kopperunjingan who ruled between 1229 AD and 1278 AD. An international famous educational institution located in 1.5 km from Chidambaram. A famous marine research centre of Annamalai University is in Porto-Novo. A Temple for Ayyappan has been built by the Annamalai University, nearer to Raja Muthaiah Medical College. It is a replica of the Avyappan temple in Sabarimala. It is the most exquisite spot. 1440 acre mangrove forest only in south India.Pichavaram mangroves are considered among the healthiest mangrove in the world Boating through mangrove forest is added attraction. One hour boat journey to beach also given fantastic feelings. Pichavaram is 16 km east of Chidambaram. Thirukadaiyur is 45 km south east of Chidambarm. Lord here is known as Amirthakadeswarar and His consort is Abirami. The temple is very big and god faces the west The Famous sacred hymn” Abirami Anthathi” was sung by Abirama battar in this sthala. Saivaite nayanmars have glorified this temple in their hymns. 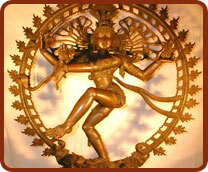 The annual Brahmotsavam is celebrated in the month of April. The temple is located at middle of the municipal town sprawls in an area of 40 acres.The God of cosmic dance Lord “Shiva” temple. Built during 11 century by Vikrama Chola and	His successors. Golden roof of this temple adds attraction to this temple. Birth place of Ramalinga Swamigal, popularly called Adigalar. He had established the sathyagnanasaba sabai. Sri Ramalinga swamigal has sung " Thira Arutpa” which expound saiva siddhandha philosophy. Vadalur is 37 km north west of chidambarm. Poompuhar, once the biggest port on the east coast, was and its peak of glory under the earlier chola kings. The river kaveri, merging with the bellowing sea, was known as puhar but due to the exquisite beauty of the port town, it came to be called poomopuhar’ Another name of poompuhar was Kaveripoompattinam.The life and time of the Tamil classic Silappathikaram has been recreated at poompuhar to the immense pleasure of the Tamils. A fine beach and calm water offer good bathing. Poompuhar is 40 km south east of Chidambaram. A famous siva temple in the same model of tanjore temple is in this town. Rajendira Gangaikonda cholan and named his new capital as gangaikondacholapuram for administrative and strategic purpose This temple constructed consists of three stories and surrounded by a huge fort like wall. Contact: 0431 — 2460136, 96264 43399. Similar to velankanni is its popular appeal is the dirham of Hazard Mere sultan syed Hameed (better known as Hazard Main). Just 4 kms north of Nagapattinam, the tomp is almost 500 years old and is capped by a golden dome and flanked by five minarates. The tank is called peer kulam and is believed to have curative powers. The dirham is visited by people of all faiths. Lord murugan temple is situated in sikkal. Nearest Airport is Trichy - 147 kms and 334 km from Chennai. Contact : 04365 - 250194 Res: 04365 - 250006. Velankanni is an unique Holy place for south Asian chiristanity which is built in late 16th century. The church is dedicated to our lady of Good health. Velankanni church is popularly called as 'Arockia Madha church'. Velankanni is about 35 km south of karaikkal. 12 km south of Nagapattinam, 350 km from Chennai. Velankanni is one of the most visited pilgrim centers of India.Main festival commences on 29th August to 8th September. © 2010 GRAND PALACE STAY, All Rights Reserved.